(Nanowerk News) Optical tweezers have been used as an invaluable tool for exerting micro-scale force on microscopic particles and manipulating three-dimensional (3-D) positions of particles. Optical tweezers employ a tightly-focused laser whose beam diameter is smaller than one micrometer (1/100 of hair thickness), which generates attractive force on neighboring microscopic particles moving toward the beam focus. Controlling the positions of the beam focus enabled researchers to hold the particles and move them freely to other locations so they coined the name "optical tweezers." 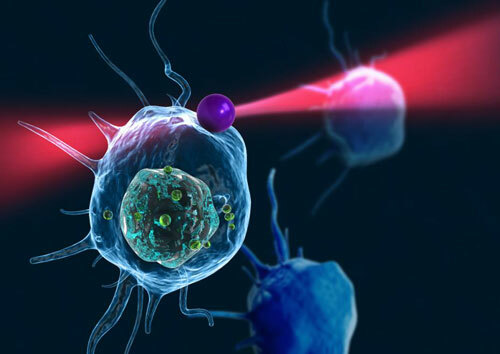 To locate the optically-trapped particles by a laser beam, optical microscopes have usually been employed. Optical microscopes measure light signals scattered by the optically-trapped microscopic particles and the positions of the particles in two dimensions. However, it was difficult to quantify the particles' precise positions along the optic axis, the direction of the beam, from a single image, which is analogous to the difficulty of determining the front and rear positions of objects when closing an eye due to a lack of depth perception. Furthermore, it became more difficult to measure precisely 3-D positions of particles when scattered light signals were distorted by optically-trapped particles having complicated shapes or other particles occlude the target object along the optic axis. Professor YongKeun Park and his research team in the Department of Physics at the Korea Advanced Institute of Science and Technology (KAIST) employed an optical diffraction tomography (ODT) technique to measure 3-D positions of optically-trapped particles in high speed. The principle of ODT is similar to X-ray CT imaging commonly used in hospitals for visualizing the internal organs of patients. Like X-ray CT imaging, which takes several images from various illumination angles, ODT measures 3-D images of optically-trapped particles by illuminating them with a laser beam in various incidence angles. The KAIST team used optical tweezers to trap a glass bead with a diameter of 2 micrometers, and moved the bead toward a white blood cell having complicated internal structures. The team measured the 3-D dynamics of the white blood cell as it responded to an approaching glass bead via ODT in the high acquisition rate of 60 images per second. Since the white blood cell screens the glass bead along an optic axis, a conventionally-used optical microscope could not determine the 3-D positions of the glass bead. In contrast, the present method employing ODT localized the 3-D positions of the bead precisely as well as measured the composition of the internal materials of the bead and the white blood cell simultaneously. Professor Park said, "Our technique has the advantage of measuring the 3-D positions and internal structures of optically-trapped particles in high speed without labelling exogenous fluorescent agents and can be applied in various fields including physics, optics, nanotechnology, and medical science." Kyoohyun Kim, the lead author of this paper ("Simultaneous 3D Visualization and Position Tracking of Optically Trapped Particles Using Optical Diffraction Tomography"), added, "This ODT technique can also apply to cellular-level surgeries where optical tweezers are used to manipulate intracellular organelles and to display in real time and in 3-D the images of the reaction of the cell membrane and nucleus during the operation or monitoring the recovery process of the cells from the surgery."